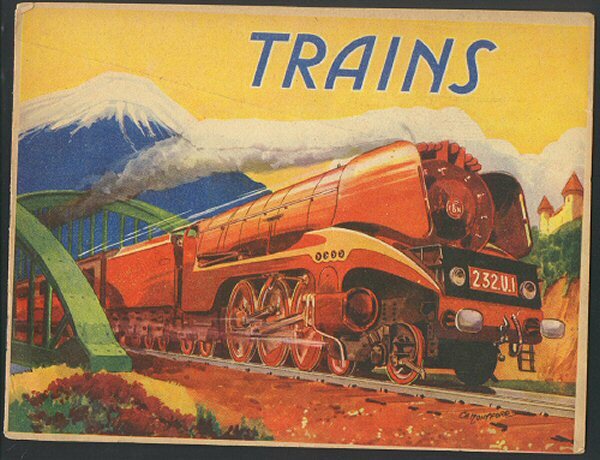 "Pamphlet - Steam Trains - Late 1930's." (1656) Pamphlet - Steam Trains - Late 1930's. - Condition: Good Plus Beautiful illustrations of several speed breaking steam engines from Europe and US. Trains include The Mallard, Cornish Riviera Express, Royal Scot Class Locomotive, and The Coronation. Illustrations are large and done in color and B&W. Pamphlet measures 9 1/2" by 7" and has 6 pages with illustrations of 8 trains. Back 2 pages has small section of corner missing (does not affect the illustration). Price: $On Auction + Shipping.